20% RATE REDUCTION, ONE WEEK ONLY! 28 Jan - 5 Feb, BVI. Award winning crew. Step into MATAU’s salon whose stunning décor has more than a dash of art deco style with pale wood, white leather upholstery and sophisticated black and red accents. The perfect setting for cosmopolitans and martinis with Noel Coward songs playing in the background. Matau has accommodation for eight in one king and three queen en suite cabins. Exceptional is the word for the king-bedded master stateroom with an en suite bath as large as the guest cabins and the luxury of a full-size Jacuzzi tub. There are so many choices on deck – the trampolines, aft deck, bridge deck, the “teak beach”, and broad steps aft (very easy water access) – that everyone will find their own favorite spot. Accommodation Description: Master cabin w/ king has large en suite head w/ jacuzzi tub & separate shower. 3 queen cabins have en suite heads w/ stall showers. 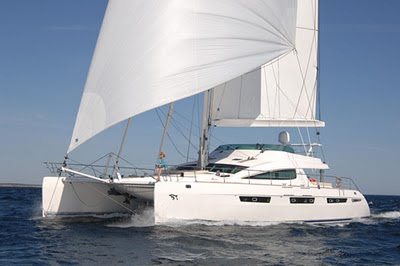 Pacific Wave is offering 10% off charter rates.